When faced with mold, often times, property owners can easily get wrapped up in the stress and hysteria. If you have discovered a potential mold problem in your property, consider calling a NJ mold removal professional who is properly trained and certified to determine the full extend of the mold development and provide you with a peace of mind. The MasterTech Team consists of trained and certified mold professionals that will guide you through the entire mold process and answer any questions you have. A Burlington County, NJ mold inspection includes: a visual assessment, moisture mapping, thermal imaging, mold sampling and testing, and a detailed report of findings. Following the completion of a full mold inspection, Your inspector will be able to provide you with all recommendations for resolving your mold problems. If remediation is necessary, MasterTech will develop a full scope of work appropriate for your specific mold needs. A MasterTech mold inspection will determine if you have mold, how bad it is, what caused it, and how to remove it. Visual Evaluation– An inspector will complete a visual analysis of your Marlton property to identify any conditions that could perpetuate mold growth in your home or business. All findings will be digitally documented and available for your records. Moisture Mapping– A MasterTech inspector will carefully map out the damp areas of the property to determine the origin of the water and how far the water has spread. Moisture meters and thermal imaging cameras will be used to avoid any unnecessary demolition or invasive methods that can perpetuate the spread of mold spores to originally unaffected areas. Mold Testing– Surface and/or air samples will be collected for testing. This will provide scientific data that can confirm or deny mold presence. If mold presence is confirmed, the additional data will help your inspector figure out the most appropriate course of act to resolve the mold issue. Report of Findings– Your inspector will compile all his or her findings into a clear and concise report for you to review and keep. If necessary and requested for, your inspector will present you with a detailed scope of work for a complete mold removal. At MasterTech, we understand the risks that you and your family face when dealing with mold. 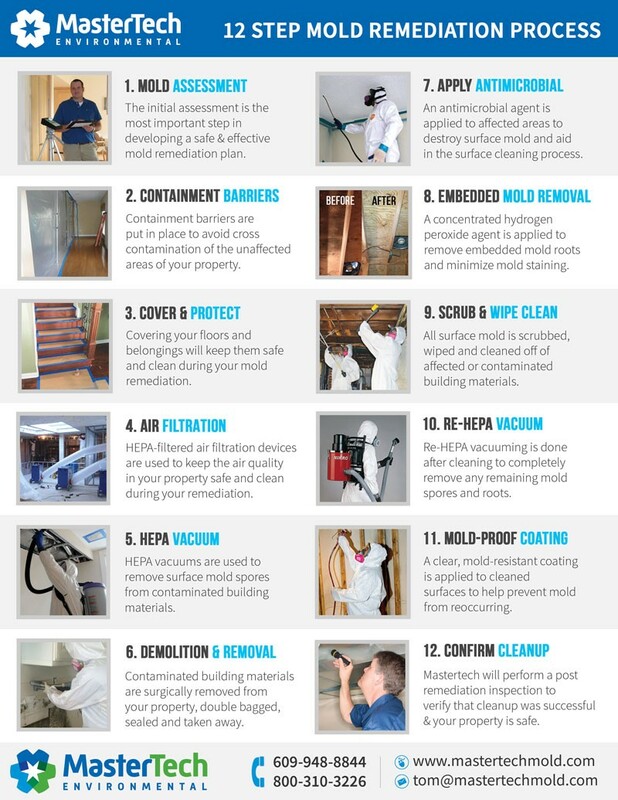 That is why each mold remediation in Burlington County, NJ is custom-tailored to fit your specific mold needs. To ensure a safe and effective mold removal for you and your family, we integrate the safest and most advanced tools, technology, and active mold removal methods to complete your mold remediation. At the core of every mold remediation are 3 key components that must be addressed to guarantee success of removal: determining causation, containing the contamination, and proper cleanup & disposal. Determining Causation– Where there is mold, there is a water source causing the mold to develop. In order to complete a successful mold remediation, our technicians will find, stop, and fix the water source. Otherwise, despite a proper cleanup, the mold will inevitably grow back. Containing the Contamination– Prior to starting the mold remediation, it is important to carefully protect the unaffected areas. MasterTech technicians are fully trained to carefully isolate all areas of concern with the appropriate barriers and covers to avoid cross-contamination. Proper Cleanup & Disposal– Most mold can be effectively removed from the surface of building materials without the use of toxic agents. In more severe cases of mold, some building materials may be non-salvageable. Our technicians are trained in the most advanced techniques for the safe, effective, and efficient removal and disposal of non-salvageable, mold-infested building materials. MasterTech provides the safes, most effective, and most efficient mold removal in Burlington County, NJ. Our remediation process integrates the most safe and effective methods and techniques to ensure that you and your family return to a clean and safe home. Every MasterTech mold remediation in Burlington County, NJ is backed by a 5 year mold-free warranty. Not only is the mold removed, but we have taken precautions to prevent its regrowth. Our priority is that we did the job right for you and your family the first time.